Kronborg Castle is a sub-area in Capital Region of Denmark area of Denmark - Europe, located in a beautiful area Visit Kronborg Castle and discover this area of beautiful and varied scenery, Kronborg Castle can offer many exciting experiences, good Restaurants and hotels, are you maybe looking for a Bed & Breakfast or camping space, you can choose from a range of options, Whatever where you go in Elsinore, you'll always find a friendly smile. Internationally known as "Hamlet's Castle Elsinore"
Kronborg Castle in Elsinore, at the entrance to the Sound is one of Northern Europe's most important Renaissance castles. It is also the most famous Danish castle, known worldwide from William Shakespeare's Hamlet, Holger the Danish and is visited each year by about 250,000 Danish and foreign tourists / visitors and is a great Danish tourist attraction. Hamlet: Kronborg Castle is known all over the world as Elsinore Castle or Hamlet´s Castle and the setting for William Shakespeare's tragedy Hamlet, one of the most famous and frequently performed stage plays in the world. We have placed Kronborg Castle at the "Elsinore Historical City Walk" on your mobile phone or printable PDF as No. In more than 400 years was Kronborg Castle headquarters for the collection of Sound Due. Kronborg is a legend in its heyday in the late 1500s. With Kronborg dangerous guns pointing directly at the ships in the narrowest Sound passage, daring seafarers nothing more than to pay the Danish king to sail pass by. Sound Dues fills the king's coffin, and Frederik d. 2. beautifies Kronborg with spiers, towers, sandstone and copper roof. Kronborg Castle is one of the finest Renaissance castles. Sea travels trade men, diplomats and royal recounts the magnificent castle and court of Elsinore with pomp, pageantry and cannon greetings. The figure of Hamlet appeared for the first time more than 800 years ago in Saxo Grammaticus’ Gesta danorum, or History of the Danes. From Saxo the legend continued to Danish writer Christiern Pedersen, who published a story about “Amleth” in 1514. This publication made the drama famous outside Denmark. A French version of the story was authored by François de Belleforest in the 1500s, and when English dramaturge Thomas Kyd interpreted the work in 1590, he turned it into a drama of revenge. 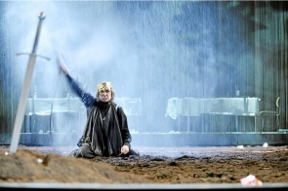 Hamlet is one of the most famous and frequently performed stage plays in the world. Since the 1600s, countless theatrical productions at the castle and many other venues have endeavoured to keep the legend of Hamlet alive. That is why Kronborg is now known all over the world as Hamlet’s castle, and Elsinore is known as the Town of Hamlet. It is now an established tradition that there a performances of plays by William Shakespeare at Kronborg Castle every summer. HamletScenen invites you to a series of magical Shakespearean evenings at Kronborg Castle in the company of guests from around the world. When the August sun sets over the historic town of Elsinore, HamletScenen will be joining forces with some world-renowned theatre companies to guarantee you some exclusive experiences in the Castle courtyard. Shakespeare’s popular works will transport you all on a journey that alternates between seriousness and poetry, and rhythm and musicality. World-class entertainment will provide you with food for thought and contemplation as you make your way home from the Castle along the banks of the torch-lit moat. Shakespeare at Hamlet’s Castle is a major Danish event and a tradition, which started in 1816 here at Kronborg Castle: spectacular, startling, world-class interpretations of Shakespeare, staged and performed by some of the most widely acclaimed artists and theatre companies of their time. These open-air performances are presented every August in the courtyard of Kronborg Castle. Read more about William Shakespeare and Hamlet play very short. Kronborg Castle - in which Shakespeare's Hamlet take place and in the casemates Holger the Dane sleep. Kronborg Castle was finished in 1585. The builder was Frederick II, and the architects were Hans Van Pieschen and Anthonis Van Opbergen. 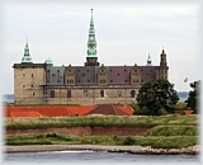 Elsinore castle / Kronborg Castle, with its unique location on the Sound, contains among other things Northern Europe's largest hall (62 x 12 m), the king and queen's chambers, the Privy Council Chamber, Queen's gallery and the chapel. Kronborg has among other 7 by Hans Knieper royal tapestries, made the hall, and coming in 1585. Kronborg Castle was November 30, 2000 declared a World monument at a conference in Cairns in Australia. This is Kronborg officially become part of the world cultural heritage. It is the UN organization UNESCO's World Heritage Committee at its annual session chose to put Kronborg on the prestigious World Heritage List. The list includes more than 600 monuments, buildings, cities, scenery etc. worldwide, which is estimated to be of universal significance. Kronborg Castle is listed in the company of, among other things Pyramids, the Acropolis and the Great Wall. Kronborg Castle gets the coveted status because the castle is a unique example of Renaissance castles, which even has played a significant role in Northern Europe's history. Frederik 2. reigns from 1559 to 1588 and held lavish parties at Kronborg Castle. Kronborg was built to impress the many visitors who come from near and far to celebrate for days. They were serviced with future gourmet dishes and beer in barrels full. Before Frederik 2. is married, he is most concerned to be Scandinavia's most powerful king. For seven years he is fighting an exhausting war against its rival in Sweden, Erik 14th. After seven years of war, none can call himself the victor. Frederik 2. spend the rest of his days to rebuild his reputation as king of the north in the Baltic and fill the treasury again. money box is virtually empty after the failed wars. Frederik 2. put a senior official, Peter ox to raise more money in Sound customs box. Sound Toll was at beginning a rose nobel per. ship, but Peter ox changed duty to cargo customs fee instead. It filled very well in the king's private money coffers and could be used to finance castles (Kronborg example) and wars that swallowed a lot of money. Very smart it was, because the ships were increased, could go further and carry more cargo and specific products, all contributed to higher revenues. Greeted a ship correctly or attempted a ship failing to pay, fired Kronborg warning shots, either from Kronborg or guard ship in the Sound. The incident was followed by "pay a fine" shoot money for guns and bullets. It will be a profitable gold mine, and the revenue ensures the construction of magnificent castle Kronborg Castle in 1574 and onwards. In 1572 married Frederik second with his young Queen Sophie. Their relationship is known as one of the happiest royal marriages in Europe. In the first ten years after the wedding night will have seven children and they are inseparable. Sophie accompanying the king on most of his travels. The king and queen resided in the royal chambers whenever they were in residence at Kronborg Castle. 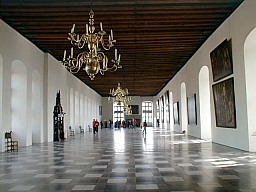 The royal chambers were originally established during Frederik II's rebuilding of Krogen into Kronborg Castle, but had to be rebuilt by Christian IV after the fire of 1629. The Ballroom was the largest royal hall in Northern Europe (62 x 12 metres). The series of large paintings on the walls were originally made from 1618 to 1631 for the Great Hall of Copenhagen's Rosenborg Castle. In the Little Hall you will find seven tapestries originally from a series of forty tapestries portraying one hundred Danish kings. The tapestries were commissioned by Frederik II around 1580. Seven more tapestries are at the National Museum of Denmark, while the rest have been lost. The word "casemate" is Latin, meaning "home in the darkness". In these damp, low areas, soldiers would stay for longer periods during sieges and bombardments. It takes little imagination to picture how demanding, physically and mentally, it must have been to be confined for days or even months in the damp and sinister casemates. The casemates are situated in the castle´s four protruding bastions. The bastions were constructed in 1574-76 as a part of the modernization of the medieval castle of Krogen, the end result being the splendid renaissance castle of Kronborg. Although approximately four metres thick, the old encircling wall of Krogen could no longer resist the improved striking power of the 16th century cannons. The new fortifications, on the other hand, would keep the enemy in proper distance from the main castle. But Kronborg was to experience several dramatic events. On the night of 25 September 1629 the castle was ravaged by fire and only the chapel survived. Christian IV rebuilt the castle, carrying out modernisations and extensive new decorations in the Baroque style. In September 1658 Kronborg was shelled and captured by the Swedes, who took many valuable art treasures as spoils, including a fantastic ornamental fountain from Frederik II's time. In the years that followed, work was carried out on the outer fortifications, and in 1690 Christian V built the Crownwork as an advanced defence against a land attack. From this time on the castle was not generally used as a residence by the royal family, and in 1785 the army converted it into barracks. A number of rooms were rebuilt, but after the army left the castle in 1923, it was thoroughly renovated and restored to how it had been in the days of Frederik II and Christian IV. For centuries, Holger the Dane has been an important national symbol for the Danish people. A bronze statue of the figure Holger the Dane, or Holger Danske, was commissioned for Hotel Marienlyst in Elsinore in 1907. The plaster figure on which the statue was based was set up in the casemates of Kronborg and gradually became much more famous than the bronze version. The statue was sculpted by Hans Pedersen-Dan. In 1985, the plaster cast had to be replaced with a concrete replica because it had been ruined by the damp climate of the casemates. The legend did not originate in Denmark at all, however, but appeared for the first time in Chanson de Roland, a principal work in medieval French literature. Holger the Dane appears in the work as one of Charlemagne’s great warriors named “Ogier le Danois”. Later the tale of Holger the Dane wandered northward, appearing for the first time in Scandinavia around 1510. A Danish version of the tale was published in 1534 entitled “Kong Olger Danskes Krønike”, or The Chronicle of King Olger the Dane. As the author Christiern Pedersen came from Elsinore, the heroic figure became naturally associated with Kronborg. The book was republished several times and was a primary source of inspiration for the Danish populace’s knowledge and awareness of the bearded giant Holger the Dane. According to the legend, when the kingdom is threatened by a foreign enemy, the stone figure will turn into flesh and blood, and Holger the Dane will rise to defend his country. The legend of this heroic mythical character was also a source of inspiration for literature and music. Hans Christian Andersen, for instance, wrote the fairytale “Holger the Dane” in 1845. Kronborg Castle - in which Shakespeare's Hamlet take place and if casemates Holger Danish sleep - was finished in 1585. The builder was Frederick II, and the architects were Hans Van Pieschen and Anthonis Van Opbergen. Kronborg Castle, with its unique location on the Sound, contains among other things Northern Europe's largest hall (62 x 12 m), the king and queen's chambers, the Privy Council Chamber, Queen's gallery and the chapel. Kronborg Castle has among other 7 by Hans Knieper royal tapestries, made the hall, and coming in 1585. Please note the Castle is closed on Mondays. Please note: From 16th of October until 22nd of October the castle is open from 10:00 until 17:00 due to the castle's Renaissance Festival. The castle is closed Monday 31st of October. The castle is closed for the public on 24, 25, 26 and 31 December 2016 and on 1 and 2 of January 2017. The castle was in 2000 on UNESCO's world heritage list. Do not forget that Elsinore has many more sights and attractions, try and see "Elsinore Historical City Walk"
Kronborg Castle in Elsinore, at the seaward approach to The Sound Øresund, is one of northern Europe s most important Renaissance castles. Known all over the world from Shakespeare s play Hamlet, it is also the most famous castle in Denmark and the Danish tourist attraction is visited each year by about 200,000 tourists. King Frederik II s Kronborg Castle is both an elegant Renaissance castle and a monumental military fortress surrounded by major fortifications with bastions and ravelins and a great Danish tourist attraction. Some of the historical rooms house collections of Renaissance and Baroque interiors, and among the most important attractions are the 62-metre long ballroom, the wonderfully preserved chapel and the statue of " Holger the Dane ". While Krogen was a strong castle, due to the emergence of new attack techniques it became obsolete as a fortress by the mid-1500s, and as a royal residence it did not meet the standards of the Renaissance period. The fact that Frederik II had married his young cousin Sofie of Mecklenburg in 1572 only increased the need for a residence more consistent with their position, as she was the daughter of wealthy duke and used to having the best of everything. The King was not lacking in inspiration for a new castle as he had seen several examples of princely Renaissance residences on his travels around Europe. Frederik II started modernising the medieval castle in 1574, and the first step was to reinforce the outer defences. Under the management of Hans van Paeschen, the fortress architect, corner bastions were constructed and connected by tall ramparts, and moats were established to the south and west. A huge square cannon tower was erected in the south-western corner, perhaps even at an earlier time, to make it possible to fire on the land side. In 1577, the reinforcement of the fortress was completed, and Hans van Paeschen resigned. Concurrently with he reinforcement of the fortress, the residence was modernised. The King s house to the north was extended and a storey was added. Apartments were fitted up for both the King and the Queen. The wings of the castle to the west and south were also heightened and connected. Rather than following an overall plan, this was more likely the result of a gradually increasing level of ambition. After van Paeschen another Dutch master builder, Anthonis van Opbergen, was engaged to be in charge of the construction work. The buildings were in red brick with grey sandstone decorations after a Dutch pattern until 1580 when the King decided to face the castle with sandstone - possibly due to its exposed location by the water or to distinguish the King s residence from the manor houses of the nobility.